Welcome To The New Zero Gravity Website! The new Zero Gravity website has gone live and we are so excited about our new look. Hyphen ltd. has been able to see our vision and make our website current, interesting and mobile friendly. Please come on over, take a look and we hope you like what you see! Follow us on Facebook for updates, pictures, news and all things Zero Gravity. 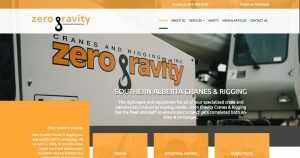 As the new website states “we really enjoy talking about cranes, rigging and everything that goes along with it.